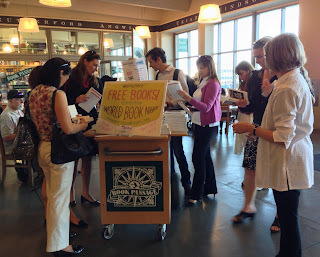 Recently, Book Passage and some of our customers took part in World Book Night (WBN). Each year, thirty books are chosen by an independent panel of librarians and booksellers. The authors of the books waive their royalties and the publishers agree to pay the costs of producing the specially-printed WBN U.S. editions. Bookstores and libraries sign up to be community host locations for the volunteer book givers. Janel Feierabend of our Corte Madera store gave away copies of La Casa en Mango Street at the Pickleweed Community Center in the Canal area of San Rafael. “The title and author were ideal for the recipients,” said Janel. “Sandra Cisneros is well received among the Spanish-speaking population all across the world, and the book isn’t too thick or intimidating. Please tell the publishers involved that it brought such joy to the recipients at Pickleweed! Within minutes, those who were waiting for children and had nothing to do became involved in the story. At one point, it looked like a giant book club with readers’ noses in the books, already smitten. I hope they didn’t forget about their kids!